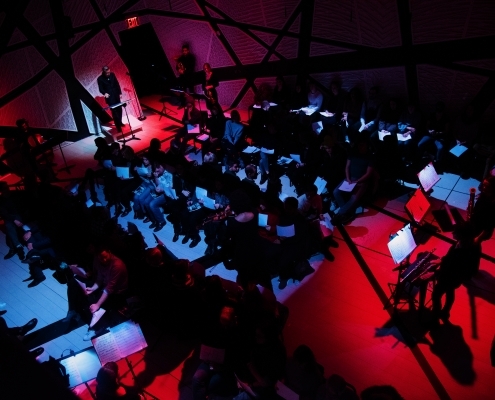 "Resonant Theatre: The Sonic Great Wall"
The FERUS festival is an annual showcase of untamed voices. 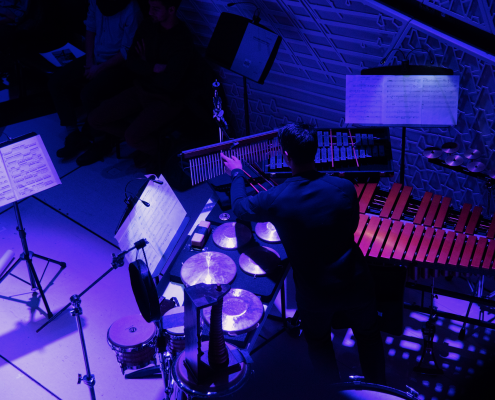 Presenting the latest in cutting–edge new music with an emphasis on performances that push the envelope, the festival invites artists to perform their newest work in music, multimedia, and beyond. 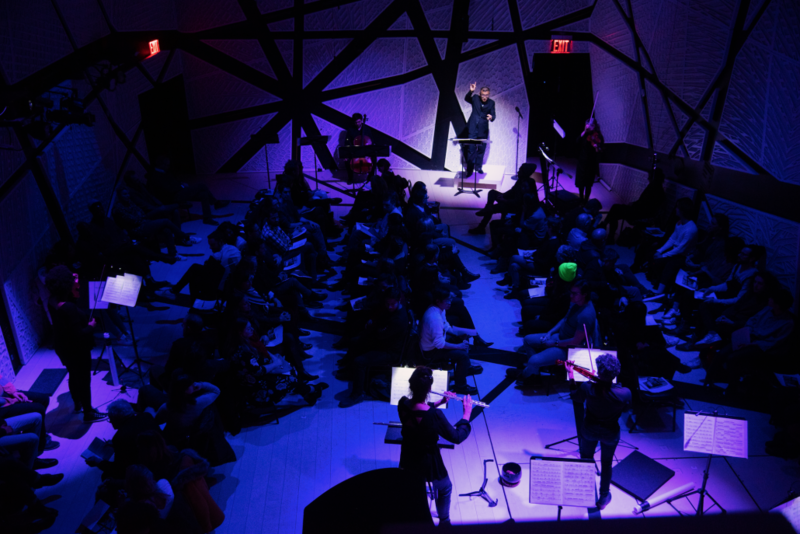 A showcase for all that National Sawdust stands for as a music venue and nonprofit, FERUS transcends traditional tropes to let audiences Hear It New! 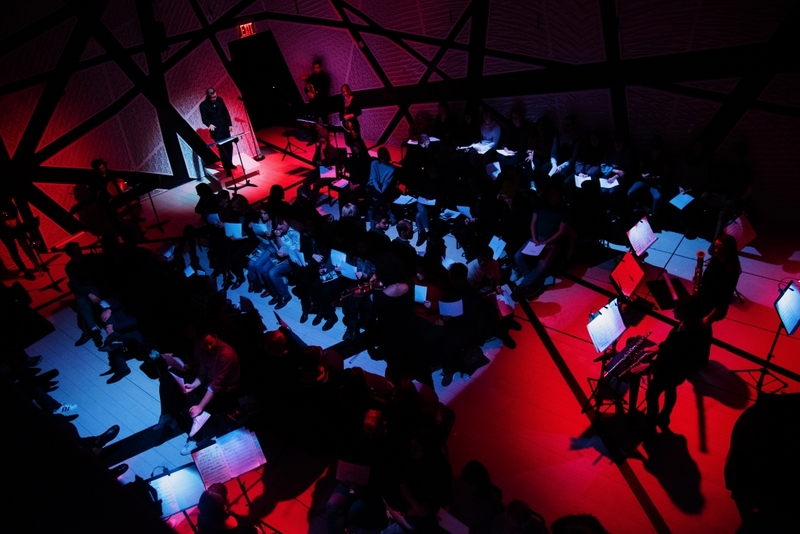 The 2019 FERUS Festival presents Huang Ruo’s daring multimedia opera Resonant Theatre: The Sonic Great Wall. 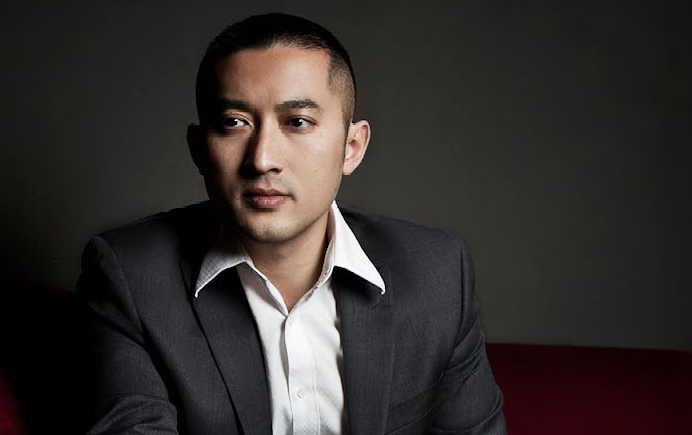 Huang Ruo is “one of the world’s leading young composers” (The New Yorker) whose work is “alluring and powerful, . . . inventive and personal” (The New York Times). Born in the last days of China’s Cultural Revolution, his effortless synthesis of new and traditional music from around the globe has garnered him international prizes and acclaim. The Sonic Great Wall draws inspiration from the Great Wall of China to disrupt the barrier between audience and performer. Huang Ruo does away with the traditional divide between stage and audience areas, inviting audience members to move freely about the space as the performers similarly circulate between outposts. With lighting and sets to complete the effect and soundscapes that change in response to where the audience members are, The Sonic Great Wall is an immersive, participatory experience like no other. This program is supported, in part, by the New York City Department of Cultural Affairs in partnership with the City Council, by the Dutch Culture USA program of the Consulate General of the Netherlands in New York, and by Art Mentor Foundation Lucerne. Huang Ruo has been lauded by the New Yorker as “one of the world’s leading young composers” and by the New York Times for having “a distinctive style.” His vibrant and inventive musical voice draws equal inspiration from Chinese ancient and folk music, Western avant-garde, experimental, noise, natural and processed sound, rock, and jazz. As a member of the new generation of Chinese composers, his goal is not just to mix both Western and Eastern elements, but also to create a seamless, organic integration. 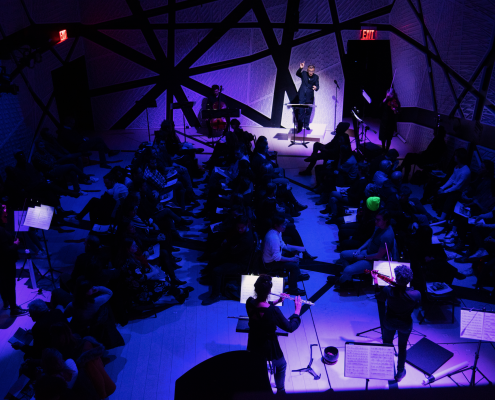 Huang Ruo’s diverse compositional works span from orchestra, chamber music, opera, theater, and dance, to cross-genre, sound installation, multi-media, experimental improvisation, folk rock, and film. Asko|Schönberg, a leading new music ensemble. 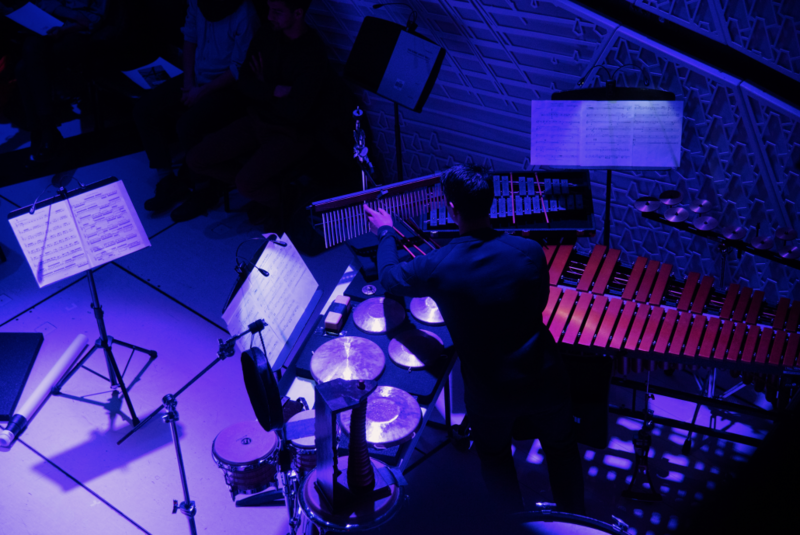 The Asko|Schönberg ensemble’s highly qualified and motivated musicians perform works dating from the 20th and 21st centuries, from solos to larger scale repertoire, both in concert settings and in interdisciplinary productions. Asko|Schönberg occupies an unassailable position in the arts through their enormous versatility, constant forward momentum, and ability to mirror topicality or even fly in the face of it. 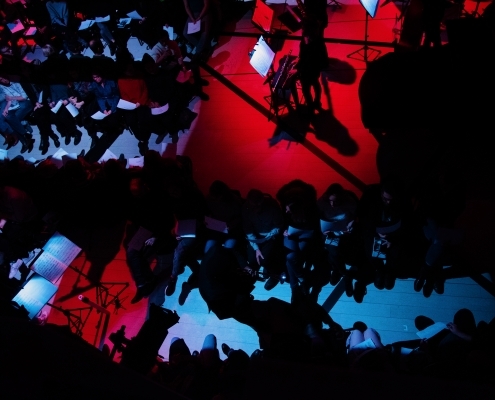 Collaboration between musicians and composers is a key element of their work. They examine musical and theatrical formats, techniques and possibilities through a dynamic working process that results in exciting discoveries, new insights, and innovative methods of presentation. Asko|Schönberg, while respecting their 20th–century heritage, is creating the repertoire of the future. The musicians are highly specialised in the performance of new music, thanks in part to their intensive collaboration with composers. Their repertoire is not confined 20th–century musical innovators such as Andriessen, Gubaidulina, Kurtág and Ligeti; the ensemble also offers opportunities to younger composers by commissioning new works each year. The ensemble regularly premieres hitherto unknown, high quality work, fresh from the printing press. They cherish relationships and cultivate their intensive collaboration with major, significant composers as well as up–and–coming younger talents. 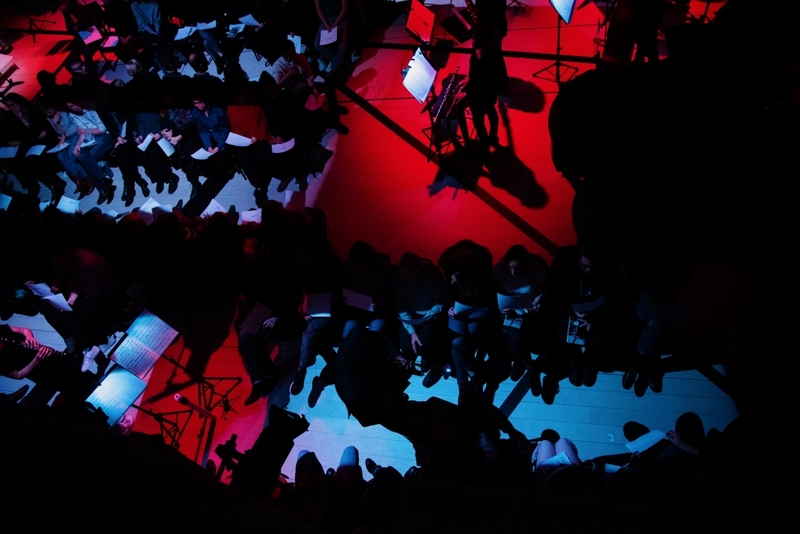 Their talent development project K(h)AOS challenges young musicians and composers to examine, develop, and present their ideas, leaning on support from the knowledge and network available within Asko|Schönberg. There are collaborative links in place with theatre companies, musical theatre groups and opera houses. 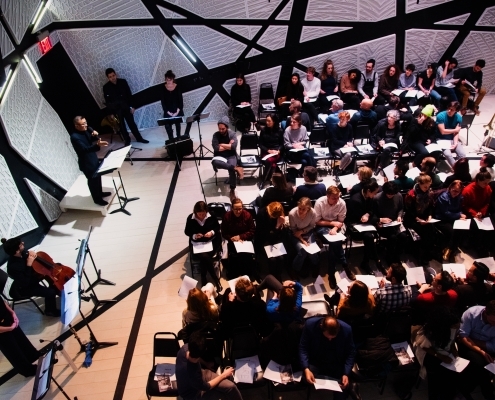 Interdisciplinary projects form an important element of the ensemble’s programming. Every year, a multi-faceted production, co-produced with the Noord Nederlands Toneel and Club Guy & Roni, tours throughout the country. The ensemble appears in a select number of concert halls both at home and abroad, and is a regular guest at festivals in cities such as Cologne, Zagreb, and Paris. In recent seasons, the ensemble has performed in South Africa, Melbourne, London, Paris, Los Angeles, New York, and Jakarta. Asko|Schönberg is the ensemble in residence at the Muziekgebouw aan ’t IJ in Amsterdam. The ensemble enjoys long term financial support from the Performing Arts Fund and the Municipality of Amsterdam. Since 2015, The Dream Unfinished has staged performances throughout Manhattan, Brooklyn, the Bronx and Queens, and partnered with organizations such as the Center for Constitutional Rights, Black Women’s Blueprint, African American Policy Forum, and others. Past seasons have centered on police brutality, the #SayHerName movement, and the school to prison pipeline, and our 2018 season, SANCTUARY, centers the current immigration crisis and its deep running roots in migrations past. The Dream Unfinished has people of color in the orchestra, in the music, behind the scenes, and in the audiences. 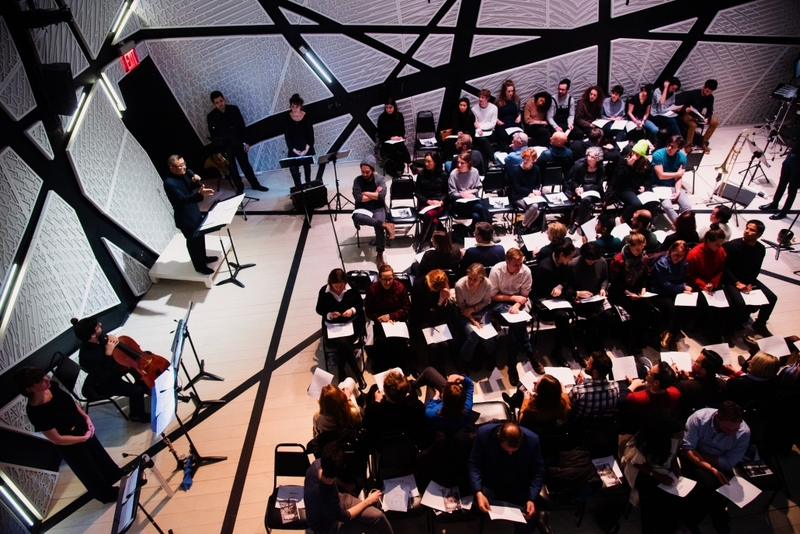 We are an orchestra that looks and sounds like New York City, and through music, explores pressing issues which are affecting our communities.